with compound eyes on two stalks with thirty thousand lenses. and spines on its head to protect its eyes. It had numerous legs with gill flaps under them. the end of its thick segmented tail had spines. and it had a gut that it could extend out as a feeding proboscis. with a flattened conical body stiffened with long spines. but with no obvious head or means of locomotion. from which protruded fleshy curved arms. Leanchoilia had two front arms ending in whip-like feelers. Its body was protected by a segmented shell like a pill bug. protecting its body from above. the second shorter and stouter. and the upper branches feathery gills. with a circular mouth on its underside having rows of teeth. a fifteen-segmented body with side lobes, and a fan-shaped tail. Ottoia was a predatory carnivorous priapulid worm. Its eversible spiney proboscis protruded from its U-shaped burrow. and had two mouth appendages with long bristle-like spines. the two sides of its thorax were hinged at the top. with pair of tentacles and gill slits on either side of its head. was a leaf-shaped animal attached to the sea floor. and a semicircular pygium rump. and two-lobed Naraoia compacta, which lacks a pygium. and protected by short ribbed spines or bristles. and under its body plates were single flaps with fringes. Interpreting the fossils of the Burgess Shale has continued. defying Darwin and the orderly progress of evolution? such as branchiopods, crustaceans, echinoderms, and molluscs? or an animal with no affinity to any living or extinct animal? discovered at first separately, separate creatures? Was Canadaspis a crustacean or an euarthropod? or were they laid out flat like the guy wires of a tent? or did it slither in the mud on its belly? Was Haplophrentis a swimmer or a bottom feeder? or did it have no eyes at all? an early crustacean, scorpion, or trilobite? Was Odontogriphus the tongue of another creature? Was it an early mollusc, brachiopod, or worm? or on special blades attached to the underside of its lobes? Was Ottoia a hunter, or did it wait for prey from its burrow? Walcott mistook Peytoia’s mouth for a jellyfish. Its feeding appendage and body were later found to be attached. but others see it as a chordate or primitive vertebrate. Were Thaumaptilon sea pens, or colonial animals like corals? Thousands of spots on one of its sides could be separate creatures. 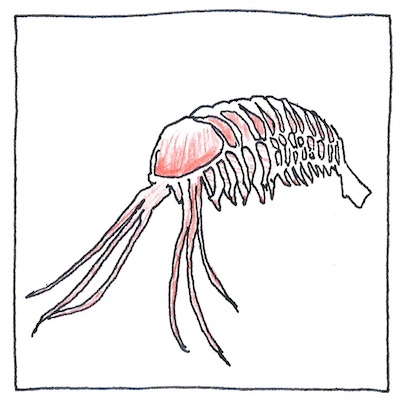 Edward Lhwyd described a trilobite in 1698 as the skeleton of a flat fish. Charles Lyttleton in 1749 described it as a petrified insect. Manuel Mendez da Costa in 1754 said it was a marine louse. and wore them as amulets to ward off disease. To me, it looks like a simple sea urchin. but is thought to be an early horse-shoe crab or trilobite. The tree of life on Earth is big and messy, suggesting it would not be improbable to find life on other planets. The strangeness of the animals discovered in the Burgess Shale strained the efforts of many including Wolcott to force them into existing phyla. Today, scientists are more likely to create new phyla to accommodate these creatures. Many of these animals are arthropods, that is, invertebrates with exoskeletons.